The newest feature on our site bumps the needle toward the relational side of influencer outreach–for both brands and agencies. Like any good tool, it makes the user more efficient in the process. 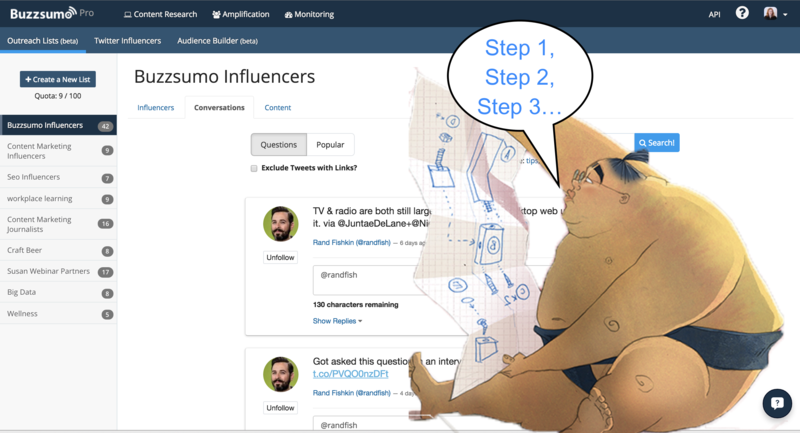 The Amplification section of BuzzSumo now includes an “Outreach List” segment to complement the “Twitter Influencers” search function we’ve offered all along. 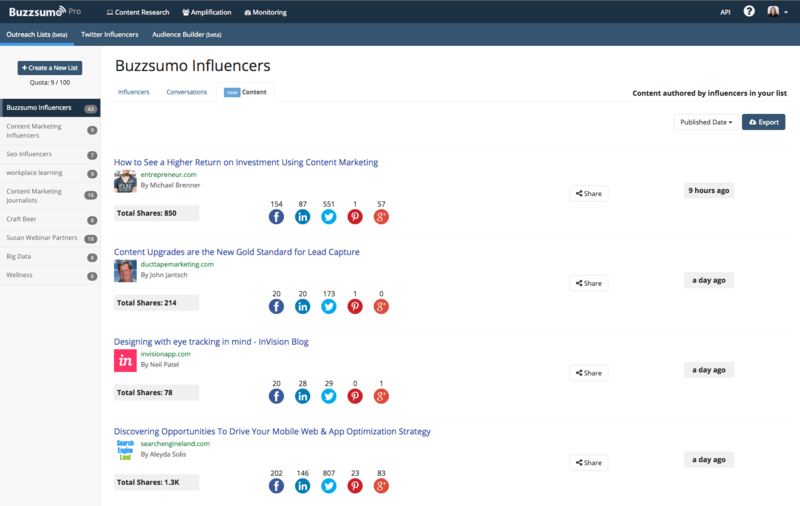 With BuzzSumo, you’ve always been able to identify influencers by topic and learn more about them via several metrics provided in the tool. Because we include engagement indicators like Average Retweets, and responsiveness indicators like Reply and Retweet Ratio, you can filter large lists of people. You can also identify those with a track record of reach, popularity, and two-way conversations on social media. You can create an influencer list by simply clicking the “Create a New List” button in the Outreach lists section. You can also create a lists when you find an influencer. Outreach lists can be tailored to the topics, projects, and industries you or your clients are interested in. So far, so good…so human. In each case if you find someone that might be a relevant influencer you can now click ‘save influencer’. This will bring up your current influencer lists. You can choose to add the influencer to one or more of these lists or create a new list. The next step is to engage with people — get to know them, before you are staring down the barrel of a deadline and need an army of retweets to get the metrics your boss requires. 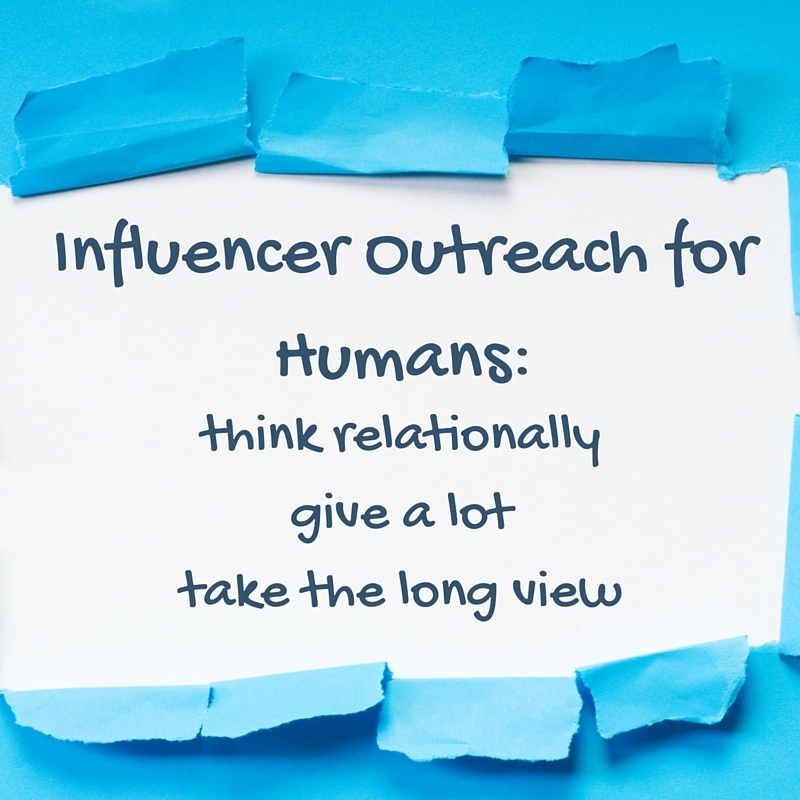 Putting relationship before request in influencer outreach mimics how we act in real life, so it’s best to start before you need something, observes Alisa Meredith of AlisaMeredith.com. For example, if I’m going to ask a neighbor to feed my fish while I’m away, it’s helpful to have established some type of connection before I hand over the key to my home. 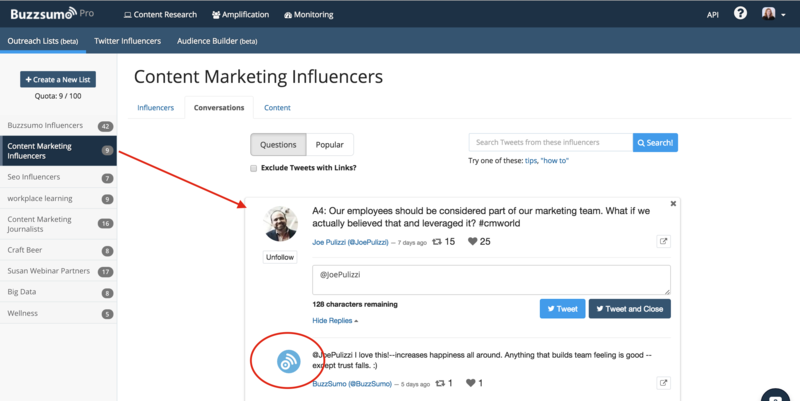 The conversations tab now available in BuzzSumo makes influencer connection much more accessible by organizing influencers and providing several nudges toward engagement. 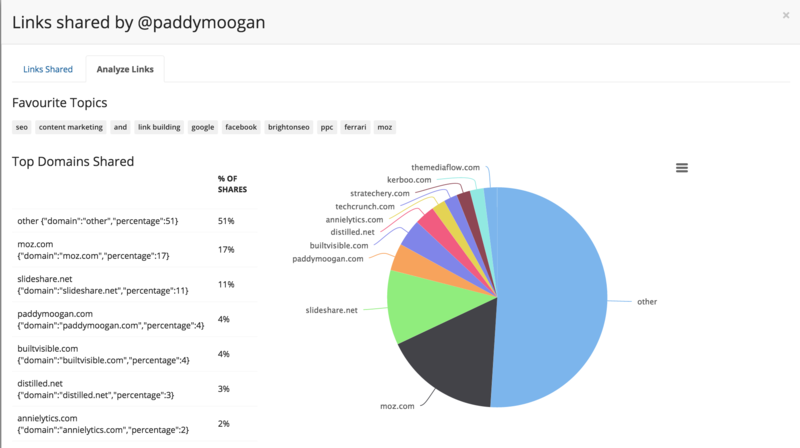 Specifically, the tool shows you your influencers’ most recent and most popular tweets, and it tracks and serves up their questions–all in one place, all at one time, according to the influencer outreach lists you’ve established. All you have to do is jump in and start interacting. If an influencer needs information or is simply shooting the breeze, you can join in. If your interaction gives them the information they need, you win. If you both experience a moment of authentic connection, that’s great, too. Nicholas Scalice of Earnworthy.com said that his influencer outreach strategy includes looking for “quick reply opportunities to build rapport with influencers and followers.” Using the conversations tab has enabled him to find questions that would have slipped by his Twitter stream. One of the difficult tasks of influencer outreach that Nicholas says he encounters is coming up with personal messages to influencers. The conversation tab simplifies this process by giving quick access to an influencer’s twitter bio and the links they have shared. If you are interested in something, like the golden globes, why not see if any of your influencers are also interested in the topic. You can connect with them authentically on a topic outside of work (or work-related), cementing your relationship and having fun at the same time. This process is simple with the search function. Simply enter the hashtag you are following and see if anyone else you know is tweeting the same content you are. The search function also lets you look for specific tweets that lend themselves to engagement. Did an influencer publish a list post, naming the top 10 tools for your target audience? Find out if your brand is on the list. Anyone who publishes content values the people who help them to amplify it. As you begin to interact with influencers, you can add value immediately and gain some name recognition for yourself by sharing their content. The content tab in the new Outreach list section makes it easy to identify and find new content pieces. The people with whom I’ve collaborated on some type of content have a special place in my social media-loving heart. They’ve helped me or BuzzSumo, and I feel grateful to them. With the conversations tab, I can check daily to see if these collaborators are promoting or organizing anything new. I can show my gratitude by helping them, tweeting their content, etc. I can also continue conversations and get helpful advice. My networking capacity is expanded because it’s easier to connect. Because the influencer conversations are organized by influencer list, efficiency is increased — for agencies, brands, and consultants. When working for one client, a consultant can find the relevant influencer’s tweets and respond or reach out. When the consultant is ready to move on, a new list of influencers for a different client is immediately available. This works well for brands, too. If you are working on a project, influencer lists help to quickly find the exact set of people who can help. If you have time allocated for networking, you can quickly find the influencers you’ve already identified, without going to Twitter. This helps you to stay on task. Matt Zajechowski from the Digital Third Coast agency sees the list function as useful in simplifying organizational tasks, keeping influencer information organized and accessible for seeking feedback or help with amplification. The hardest part of the influencer process, according to Matt, is getting the conversation started. To start a conversation organically, he recommends following an influencer on social and commenting on their recent articles. This can help you to stand out from a pile of requests for help. Both of those tactics are much simpler with influencer lists, the conversations tab and author alerts. The conversations tab in BuzzSumo gives you a 5-click method to simplify the task. Of course you can go beyond this, but the design of the new tool provides a powerful visual cue to get you moving in the right direction. People often ask how to get started in an influencer campaign. 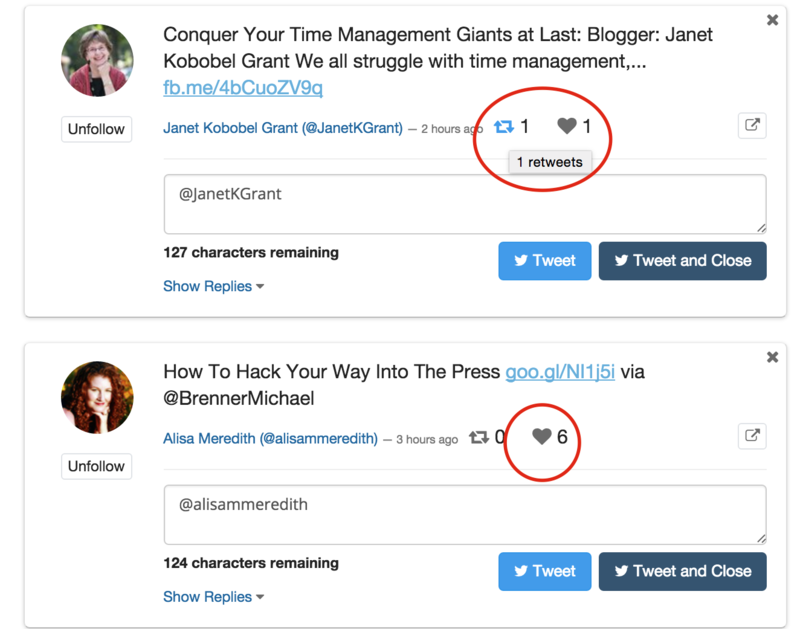 Engagement can begin very simply — following someone on Twitter, setting an alert to be notified when they publish new content. 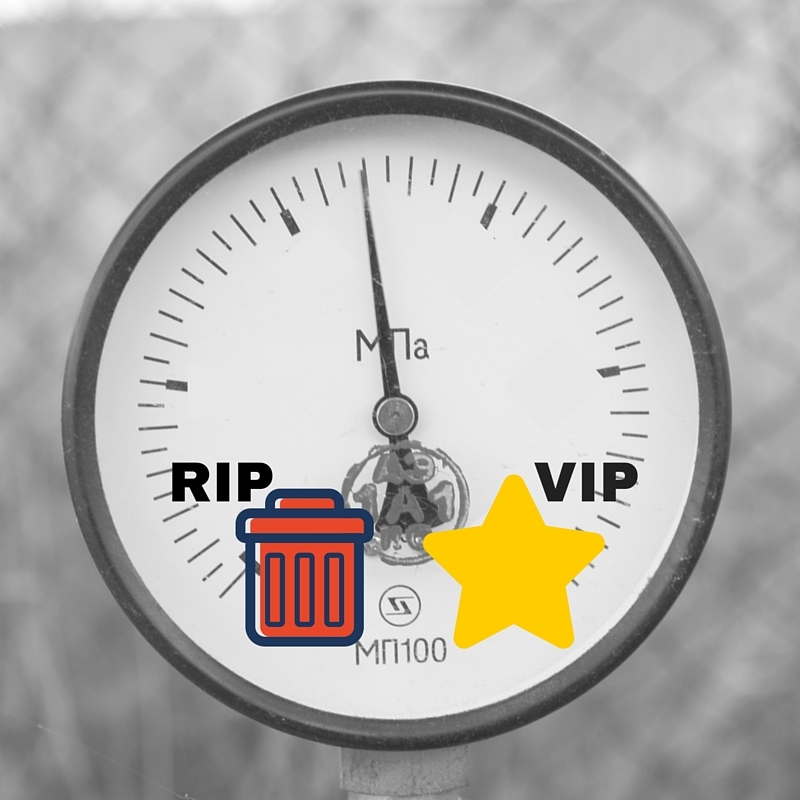 But, as Matthew Barby advises, it’s best to keep the influencer’s best interest in the forefront of your mind. Keep asking yourself what the influencer’s incentive will be. With authentic influencer engagement, giving is the new getting. The wisest practitioners are those who approach interactions with an eye toward how they can add value for the influencer. John Bogdanski of RoarIsabella understands this. Offer to share the other content from the influencer to your mailing lists and social following (if you have a large list or following). BuzzSumo’s conversations tool provides an ideal online room, You can add your customers to an influencer list and become their biggest fan You can develop and maintain communication in a way that solidifies your relationship and encourages their advocacy on your behalf. Of course, it’s naive to think that all influencer outreach will be a finely crafted personal experience. In advising a human approach, we’re advocating principals: think relationally, give a lot, take the long view. 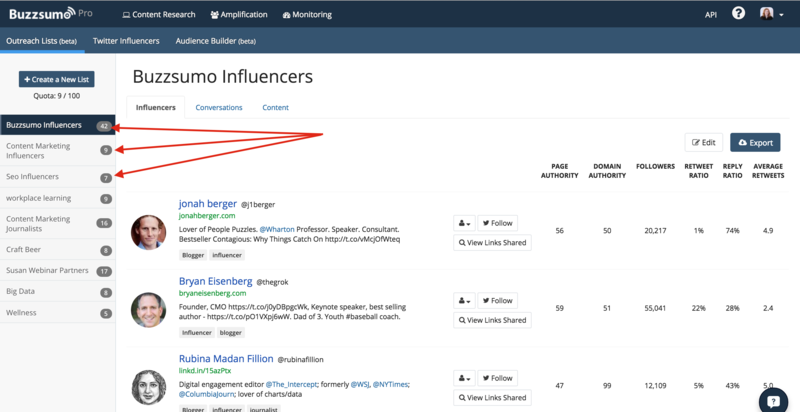 That said, the Influencer Lists at BuzzSumo can also lend a hand if you’d like to advertise to a particular group of influencers. Once you begin conversing with people, you can hone your lists. If someone isn’t a good fit, you can remove them. If they are very responsive, you can bump them to a higher level of engagement. Just like the relationships you have with other humans in real life, your circles of influence will change over time. Expect to connectmore deeply with some people, less frequently with others. It all begins with a conversation. Outreach lists and conversations are available to Pro and Agency plan subscribers. Pro users can create up to 10 lists; Agency users can create up to 50. The Audience Builder is available to Agency subscribers. This looks great. Finding opportunities to add value and interact at the same time could be a game changer on how influencer marketing is done. I’m so excited to put these new features to use. Brilliant! Thanks as always for all of the great work you’re all doing here. Great Sam! I’m glad you are enthusiastic about the tool. I’ve been using it a lot myself, and I think it’s really helpful. Looks great! I think we’ll be giving BuzzSumo a shot at Process Street and see how it works out for us. Since we’re doing a push towards influencer marketing, I’ve been thinking about collating expertise from people and companies doing a good job with it. Highly recommend it! 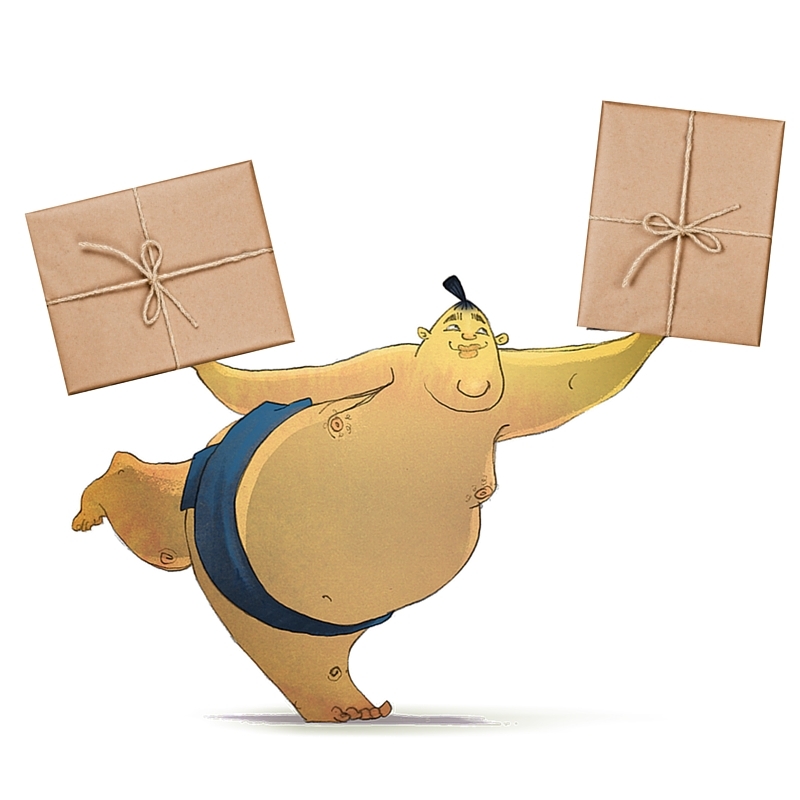 🙂 We use BuzzSumo — great tools! You’ll also like some of the content idea possibilities with BuzzSumo. Loving the new tools for influencer marketing!!! Awesome Content, First Time on your Blog an i cant stop Reading Tips an Usefull Traffic Ideas! I will Def be Back!! I believe creating great content is a necessary prerequisite for Influencer Marketing in general. I run a content creation company, and starting to get into promoting content. Learnt a lot from this post! Great article Susan!Thanks for sharing! However, I want to know do you have specific social media platforms that you think work best when engaging to bloggers/influencers?